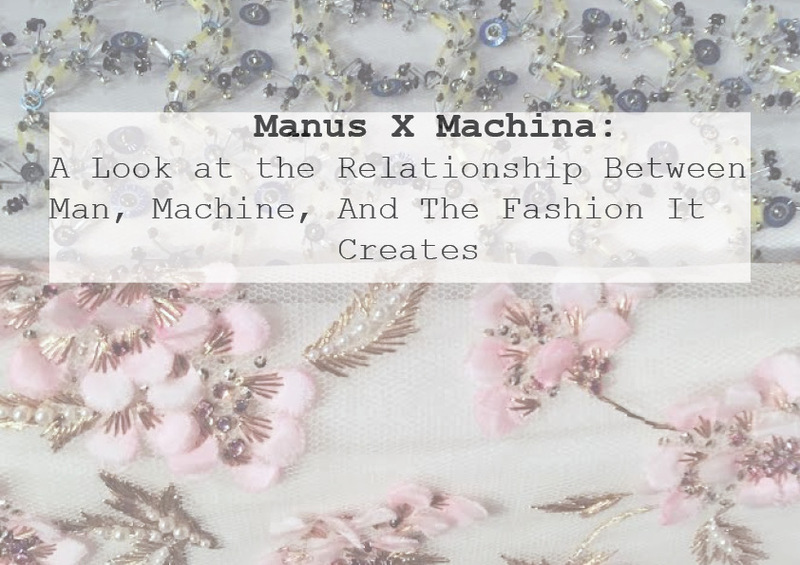 We're only a few hours away from fashion's biggest night of the year, the Met Gala, so I decided it was only appropriate to reminisce with the exhibit subject to last years theme, 'Manus x Machina'. Last year I had the amazing opportunity to see the exhibit in New York. 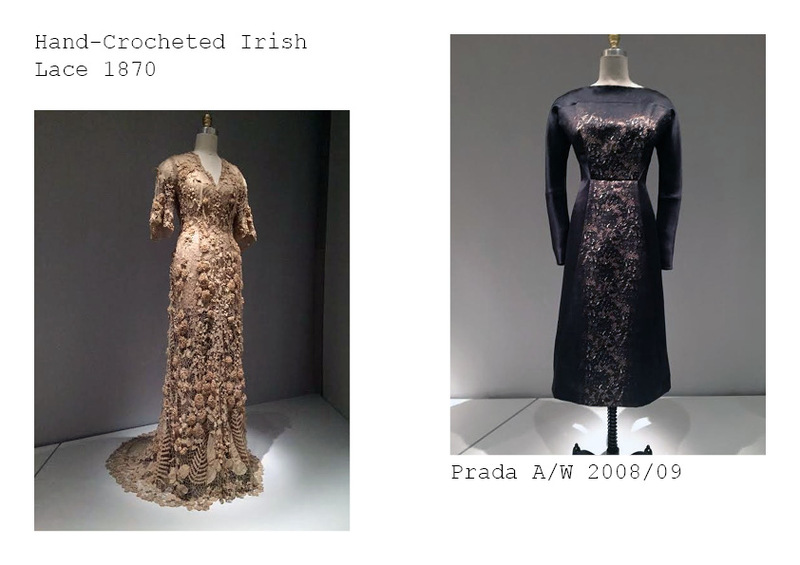 ‘Manus X Machina’ was the spring/summer exhibit located in the Anna Wintour Costume Centre of The Metropolitan Museum. The exhibit follows the relationship between handmade clothes, entirely machine made clothes and the marriage between the two. The exhibit was sponsored by Apple and the 170 plus pieces were curated by Andrew Bolten. The exhibit follows the founding of haute couture in the early 19th century to present day where machinery is heavily evolved and its relationship with the mass production of clothes and thus the dichotomy between haute couture and ready-to-wear garments. The exhibit is only part chronological, as it focuses more on the comparison between the two rather than the continued advances of machinery and eventual separation of man-made and machine-made. The exhibit is also based on 18th century philosopher Denis Diderot’s ‘Encyclopédie’, which categorised arts and crafts into disciplines among the sciences. They are split into six sections, broderie (embroidery), plumasserie (featherwork), paurier floral (artificial flowers), maroquinerie (leatherwork), dentellerie (lacework), and plisse (pleating). Beyond this there is also a room dedicated to ‘tailleur et flou’ (tailors and dressmakers), which showcases some works from Chanel. 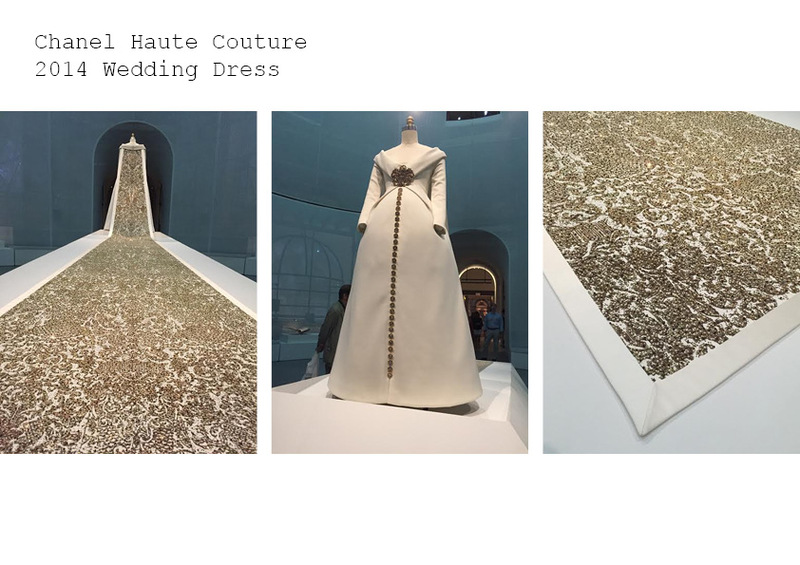 The first thing visitors see in the exhibition is a haute couture wedding dress, designed by Karl Largerfeld in 2014 for Chanel with a 20ft train in a cocoon shaped room. The gown was a perfect introduction to the exhibit as it perfectly displays the conflict and harmony between man and machine. The dress was made of a scuba knit material, made by machine, and while the finished garment was sewn together by hand, the rhinestones appliquéd by hand onto the dress were 3D printed and the pattern on the train was machine stenciled onto the dress to make sure it was 100% accurate, before being carefully hand painted with gold metallic pigment. White scrims were placed around the exhibit and one carefully placed on the domed ceiling of the cocoon room, with a video projecting the said garments’ making of with close up details of the dress and the meticulous work done by hand on the train. Surrounding the dress and encased in glass are books from the 18th century written by Denis Diderot, open on different pages in their original French. When you leave the entrance room you walk into a circular hallway that goes right and left showcases different garments. As the exhibit is not chronological, it doesn’t matter which way you go. 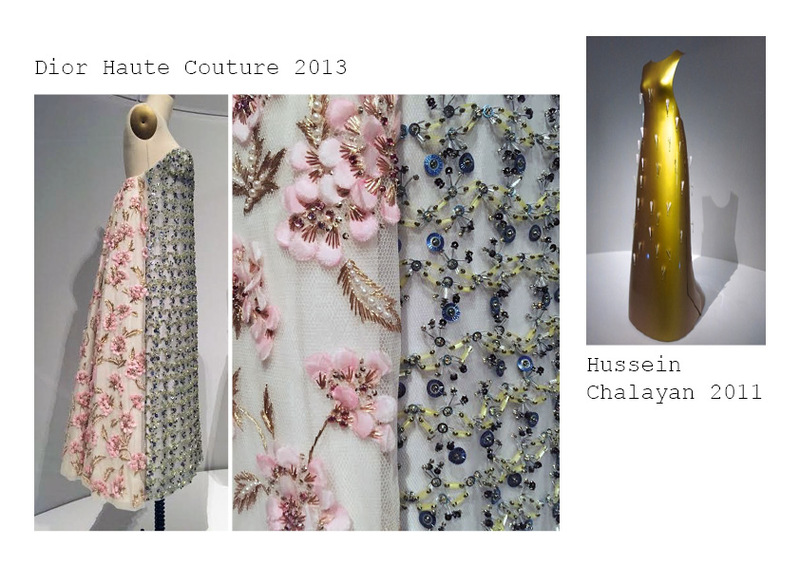 While some of the garments are shown in groups to show contrasts or similarities, some are shown separate such as a dress shown in Yves Saint Laurent debut collection for when he was creative director at Dior. The trapeze shaped dress named ‘L’Eléphante Blanc’ (The White Elephant) pays homage to a popular Parisian night spot, the much-romanticised Eiffel Tower. 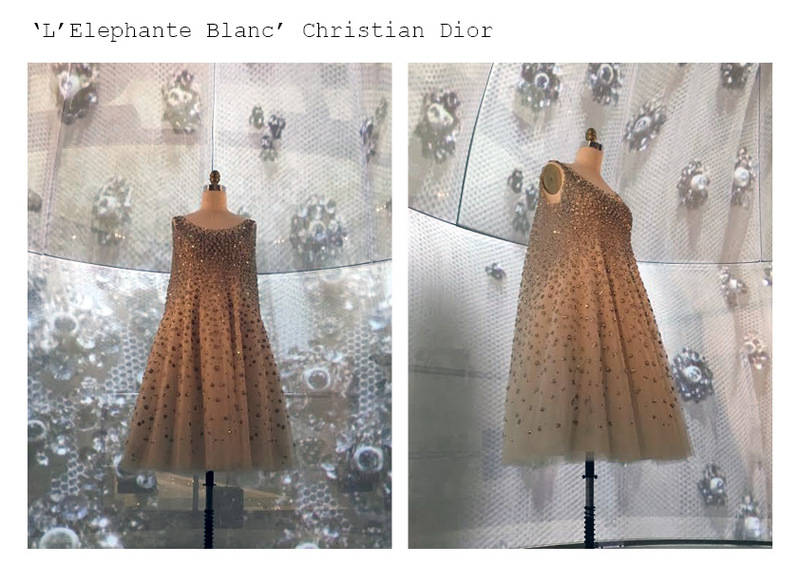 While the dress was in Dior’s haute couture line up, it is machine sewn, as it demanded a rigid under-structure and more than five layers of tulle, giving a seemingly effortless sway, so much so that one observer commented that it had been, “constructed with the architectural finesse of the Eiffel Tower.” The dress has embroidered crystals meant to look like constellations shining through the infrastructure of the Eiffel Tower. Encircling the neckline are a chevron set of crystals that are punctuated with clusters of looped tassels with beaded strands. 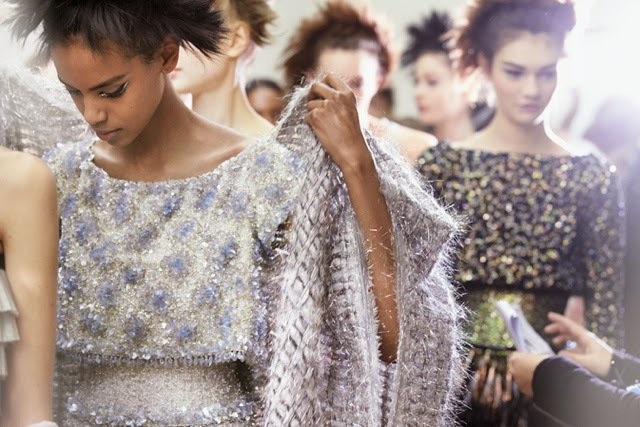 In other parts of the dress, embroidered dots of silver thread, crystals and rhinestones, these are all painstakingly applied by Christian Dior’s faithful ‘brodeur’ (embroiderer) Maison Rébé. Without the use of machine in the construction, it is almost certain that the construction would not give as effortless a feel than if the heavy layers of tulle were held down and hand sewn by a person. 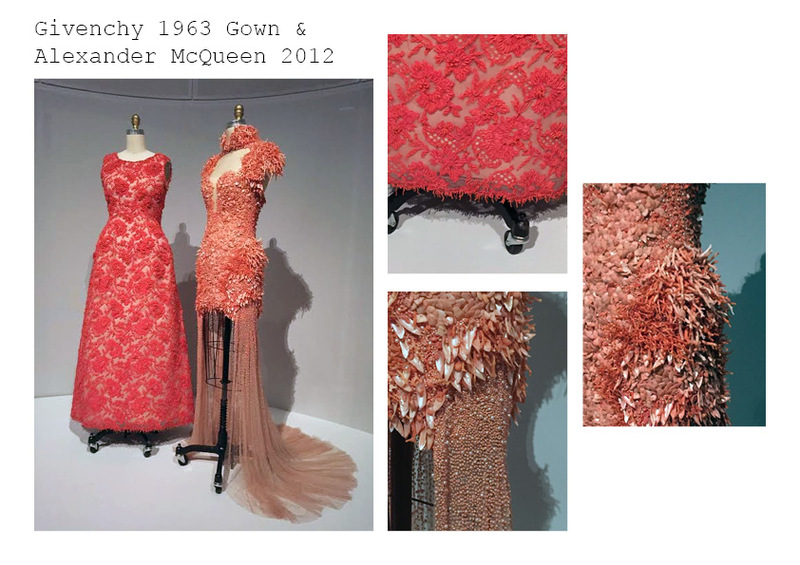 Some themes that also ran throughout the exhibit were how certain styles can come back after a prolonged amount of time, one such example is of two coral dresses, one made by Sarah Burton for Alexander McQueen in 2012, covered in appliqué shells and coral and a Givenchy dress from 1963, made from orange cotton lace, hand embroidered with glass beads and pieces of coral. The two differ greatly in a lot of ways but do manage to have similar details such as with similar coral appliquéd onto the gowns, however Givenchy chose a simpler silhouette, as he liked to play between the lines of excess and reduction. It is in this that Sarah Burton’s design differs greatly. The Alexander McQueen dress is a mini dress with a plunging sweetheart neckline, a dramatic neckline, heavy shoulders, peplum details on the hips made of built up coral and a long train with glass beads and appliquéd shells. All the garments just mentioned all fall within the 'broderie' category and are fine examples of the relationship between man and machine, but the next dress I have to talk about falls into the 'parurier' floral category, I think this dress personally exemplifies what it means to have a relationship between man and machine in haute couture. The flowers are in all perfect proportion to each other because of machine but still retains the romantic sort of aspect that is associated with haute couture and the making of garments by hand. This dress was made for Raf Simmons debut collection for Dior in 2013. The dress itself is a juxtaposition, two different coloured fabrics, a cream tulle for the back and pure white for the front, the colour is so subtle I didn’t notice until I zoomed in to my photo. The front panel of the dress, with the white tulle has beaded blue forget-me-nots on them, while the back panel has appliqué and beaded pink coronations. The material for the petals were first treated with flour or gelatin to improve its malleability, in the past, it was commonplace in haute couture for each flower to be individually stamped from a press by hand in layers to enable 12 to 24 petals to be created simultaneously, but for this dress the petals for the coronations were stamped by machine rather than malice, then hand dyed in a cold water solution, as you can see each petal is slightly varied in colour to give fuller dimension, then shaped, crimped and anchored by hand sewn beads. In contrast to the appliquéd delicate flowers of Dior, was Hussein Chalayan’s ‘Kaikoku Floating Dress’ which was fibreglass dress painted gold, with what first appears to have tassels adorned onto it, but is actually remote controlled paper ‘pollen’, which shoots up from the dress and then spins in the air. Before I went to this exhibit, I believed that in the world of haute couture and high fashion, man and machine were as different as night and day, but from the first garment, the monumental Chanel gown, standing as a superlative for the dichotomy between man and machine, challenging my opinion on the matter. The exhibit does not place one technique over the other, and the visitor leaves with the conclusion that for the best garments to be made, there is a harmony between the two. Each contributing something unique, a naturalness that can only be done organically and an exactness done in a microscopic scale, each making a garment that the other could not do completely by itself, Manus x Machina breaks the confines of haute couture and pret-a-porter fashion as we usually perceive it to be. 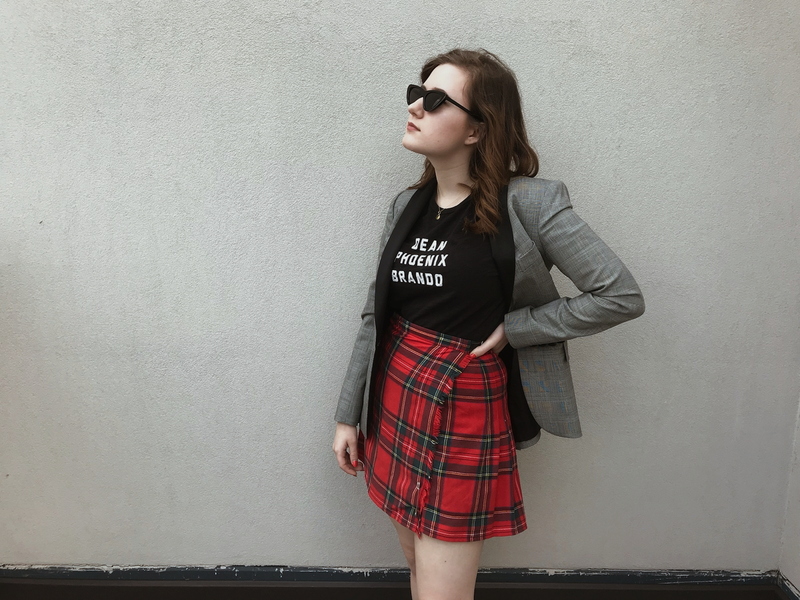 Wow, amazing fashion and great pictures too!